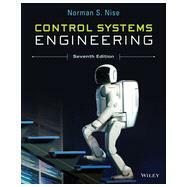 Highly regarded for its case studies and accessible writing, Control Systems Engineering is a valuable resource for engineers. It takes a practical approach while presenting clear and complete explanations. Real world examples demonstrate the analysis and design process. In addition, helpful skill assessment exercises, numerous in-chapter examples, review questions, and problems reinforce key concepts. Tutorials are also included on the latest versions of MATLAB, the Control System Toolbox, Simulink, the Symbolic Math Toolbox, and MATLAB’s graphical user interface (GUI) tools. "What If" experiments help expand an engineer’s knowledge and skills. CHAPTER 2. MODELING IN THE FREQUENCY DOMAIN. CHAPTER 3. MODELING IN THE TIME DOMAIN. CHAPTER 5. REDUCTION OF MULTIPLE SUBSYSTEMS. CHAPTER 8. ROOT LOCUS TECHNIQUES. CHAPTER 9. DESIGN VIA ROOT LOCUS. CHAPTER 10. FREQUENCY RESPONSE TECHNIQUES. CHAPTER 11. DESIGN VIA FREQUENCY RESPONSE. CHAPTER 12. DESIGN VIA STATE SPACE. CHAPTER 13. DIGITAL CONTROL SYSTEMS.